Will Dmitry Medvedev live up to the expectations world leaders have placed in him? Is Russia prepared to make the changes the president outlined in his recent article? The man who once faced similar crossroads believes it can happen. Mededvev's article - published on the opposition-leaning Gazeta.ru website - brooded over "excessive government presence in many significant aspects of economic and other social activities." He slated Russia's economy, which "still reflects the major flaw of the Soviet system [and] largely ignores individual needs". Medvedev wrote "civil society is weak" and suffers from a "lack of initiative, lack of new ideas, outstanding unresolved issues, the poor quality of public debate, including criticism". Most importantly, in stark contrast to many among Russia's ruling elite, he reached out to his constituents. He called on "all those who share [his] convictions to get involved... [as well as] those who do not agree with [his] ideas but sincerely desire change for the better". "Our people like to say, in [poet Vladimir] Mayakovsky's words, `We can't do anything. Let the leaders think'," mused Mikhail Gorbachev. Age has taken its toll on the former leader. But his phenomenal memory and engagement with the future buries any suspicion of mental feebleness. "Medvedev's article was a genuine appeal to his people. That's very important. "He didn't get too specific, but that wasn't his goal. It was his calling to us to get involved in solving the problems he presented. In that, he was successful," explained Gorbachev. He reminisced about his own turbulent and historic years of power and transformation. He is keenly aware that, for Russians, the Gorbachev era still begs the question: at what price, reform? "Falling oil prices were a big blow to our economy. We lost two-thirds of our foreign currency and weren't able to provide the market with basic goods. That's when the lines began to form. "It's now official that the United States had pressured the king of Saudi Arabia into boosting oil production. It hurt." The long breadlines contributed to his unpopularity at home. While some in the West remember when censorship was lifted, Russians associate him with the loss of empire. When he made a bid for the presidency in 1996, he finished with just 0.5pc of the vote. While it is clear that Gorbachev may never be entirely understood at home he, too, is looking forward and is surprisingly unburdened by regret. "[My opponents] used the situation to destroy the Union and undermine me as president. They were eager for Ukraine's declaration of independence. What Union could there be without Ukraine?" he said. The man who once led nuclear weapons reduction negotiations with President Reagan and accepted the Nobel Peace Prize, recently advised Barack Obama prior to the first summit with a newly elected Medvedev. "A few years ago I was at a major university in the Midwest," he recalled. "They pressured me into answering questions about America. I told them: `You're going through a process everyone goes through. "But Obama will have a difficult job," he added somberly. "He's already facing problems, but they will only get worse. Obama is democratic, calm, confident and has a strong character. I hope he succeeds." Gorbachev is dismissive of the idea of top-down changes in Russia. "I really wish that our leaders wouldn't be afraid of their own people," he explained, pounding the table for emphasis. "We need people to get involved, and share ideas with policy makers." 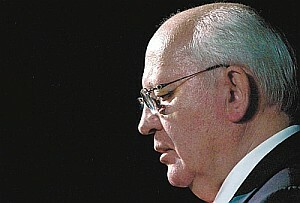 Gorbachev recently attracted headlines for criticising Putin's statement that he would "sit down" with Medvedev and decide who would be president in 2012. "What about the people? The people have to decide who will be president," Gorbachev said. "If we come out of this crisis, but don't reform our economic and political structures, we'll find ourselves at a dead end. We'll go in circles, but with harsher consequences each time. Medvedev was right in that we need to switch to a new model of development, one with human values at its core," he continued. When asked if the country needed a "new Gorbachev", he laughed: "I'm not going anywhere! Medvedev should utilise public organisations - like our own Gorbachev Foundation - we're always happy to provide ideas." Apart from his think tank, Gorbachev recently co-founded the Independent Democratic Party of Russia with his billionaire ally Alexander Lebedev. Lebedev has been less than exuberant about the party's prospects: "We'll have to hold meaningless rallies and gather signatures in half of Russia's regions...and then our application will be rejected because of some misspelled word." Medvedev, however, talks the talk of a multi-party system. "I think Medvedev is a very educated, thoughtful and democratic person. But he must form characteristics a leader needs. He must learn to feel the pulse of the country's life, to take hits and defend his positions," Gorbachev added. He was less flattering toward United Russia, the primary pro-government party: "It's a poor copy of the CPSU (Communist Party of the Soviet Union). A recent electoral law brought changes to Russia's political system. An overwhelming majority of those changes were exclusively favourable toward United Russia. I'd challenge you to try and pass any initiative without that party's support. It's not right." In the same vein, President Medvedev said recently, "I don't know how much longer United Russia's triumphant power will continue." He predicted that in the future, Russia will experience a political system with many parties in constant competition. "Democracy is a priority," Gorbachev concluded. "The president's main message was that we need to move forward through dialogue, and for this we must have freedom so people can feel confident in themselves. Let them be wrong: everyone makes mistakes. But as long as this dialogue takes place, we'll enter a new epoch of development."